Soy allergy symptoms can range from mild to severe. If you've had a reaction to any food that you've eaten, it's important to identify exactly what food has caused this reaction so that you can be sure to avoid it in the future. Food allergies cause an allergic reaction when certain foods or additives are digested. More specifically, the immune system in an allergic person misidentifies proteins in the food as a threat to the body. Symptoms can be sudden and severe, or occur over a period of time and be generally mild in nature. Intolerance is similar to food allergies, but in this case, the digestive system struggles to break down and absorb certain foods. Food allergies and intolerances are often lumped together as the same condition. Soy allergy symptoms can be fairly mild or quite severe. Often the reaction will depend on how much soy product was ingested, but sometimes even a very small amount can trigger an allergic episode. Here are some soy allergy symptoms that are common. If you suspect your infant is developing an allergy to soy, see your pediatrician immediately and discontinue the soy-based formula. Try a hypo-allergenic baby formula instead, such as Nutramigen. 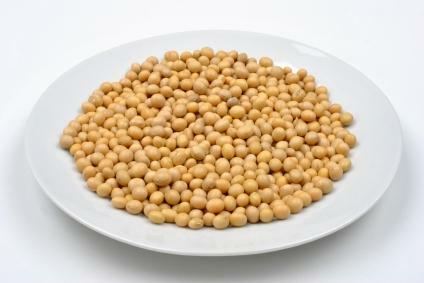 Children usually outgrow a soy allergy by the time they reach age three. It's important to note, however, that adults with soy allergies are growing in number. If you are allergic to soy, the only real way to avoid the symptoms is to avoid soy completely. This can be difficult, considering the prevalence of soy and soy products in today's modern diet, especially if you are vegetarian or vegan. Since soy can be a major source of protein in the vegetarian and vegan diets, speak to your doctor or a nutritionist to make sure that you will be getting enough protein and other vital nutrients after eliminating soy. There are many alternatives to soy, including nuts and legumes, and for some vegetarians, dairy and eggs. The best way to make sure that you don't ingest any soy products if you're allergic is to read food labels very carefully. By law, manufacturers in the United States are required to clearly label food products that contain soy. Any item that claims to contain "vegetable protein" is suspect, however. If you are unsure, don't eat the item.When eating out, you can always ask servers for the ingredients in your meal, or ask specifically if there is soy in the dish you want to order. Make sure you steer clear of any dishes that contain tofu. If you think you may have an allergy to soy, make an appointment with your doctor. Allergy tests can determine the cause of these reactions, and you'll learn which foods are causing them. Tests can be done on infants as well as children, adults, and seniors. Remember, food allergies can develop at any stage. If you or anyone you know experiences a severe allergic reaction, call 911 immediately.